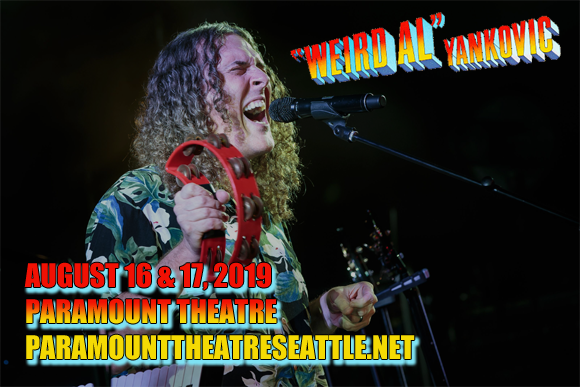 Known for his outrageously catchy parody tunes like "Like a Surgeon", "Eat It" and "White and Nerdy", Weird Al Yankovic comes to Paramount Theatre Seattle on Friday 16th August 2019 on his Strings Attached Tour! The accordion-wielding, polka playing comic will be joined by a full symphony orchestra and bevvy of backing musicians to perform his "most full-blown, over-the-top extravaganza ever"! Starting out as a university DJ in the late 1970s, "Weird Al" Yankovic is an American comic singer-songwriter, film/record producer, satirist, and author. Since the release of his debut single "My Bologna" (a parody of "My Sharona" by The Knack), in 1979, Yankovic has recorded more than 150 parody and original songs, performed more than 1,000 live shows and has sold over 12 million albums. His parodies and pastiches of popular songs, often in a polka style and played on the accordion, have earned him four Grammy Awards from eleven nominations, and four gold records and six platinum records in the United States. His knack for uncanny scene-for-scene recreations in his parodied music videos aided in his success and led to Yankovic directing music videos for several other artists, including Ben Folds, Hanson, The Black Crowes, and The Presidents of the United States of America. His debut film, UHF, which wrote and he starred in, was released in 1989, and he also wrote and starred in The Weird Al Show (1997). After almost three decades in the industry, Yankovic scored his first top-ten single and album with "White & Nerdy" and Straight Outta Lynwood. His most recent release is 2014's Mandatory Fun, which became his first number-one album in its release week.